Marriage sometimes brings out the worst in people. The Malefactor’s Register has chronicled so many crimes in which the husband kills the wife, or the wife kills the husband, that to list them all would take up all the space reserved for this post. Even hiring someone else to do the job doesn’t make the crime that extraordinary. What is unusual, is when another relative takes a dislike to a son-in-law or daughter-in-law, and takes steps to end the marriage. In the case of John Briggs, his mother-in-law was a nasty old shrew whose life was irrationally centered around her daughter, Norma. She did everything she could to break up the marriage and when an unusual car accident prompted the car in which she was riding to plummet down a cliff, she convinced police that her Briggs had tried to kill her. Olga Duncan was involved in a similar circumstance — her mother-in-law was a conniving, cruel, controlling, and hard-hearted woman who would stop at nothing to win back her son. Her scheme resulted in murder and sent her to the gas chamber. How she brought on her own downfall, and that of those around her, is a tragedy of Shakespearean proportions. Like Othello and Desdemona, the love of Olga and Frank was torn apart by the machinations of someone who should have been a trusted friend. Elizabeth was more than just a mother-in-law who resented losing her son to another woman. She was a cold-blooded bunco artist who preyed on men and had, according to her own testimony been “married” more than a dozen times. Most of the marriages were shams or at least bigamous, and were simply arrangements to steal money from the men, either through outright theft or alimony. Despite so many relationships, Elizabeth had two children, one of whom was a son named Frank, who, as far as she was concerned, was the center of the universe. In 1956, Elizabeth and Frank, who lived together, moved to Santa Barbara, California, where 27-year-old Frank began his career as a lawyer. Their relationship was incredibly unhealthy, but not incestuous. 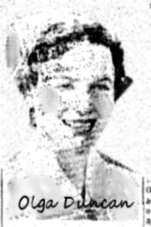 Elizabeth simply “doted upon and wrapped (Frank) in a suffocating mother love, obsessed with anxiety that he would one day leave her,” wrote true crime author Colin Wilson. So smothering was Elizabeth’s obsession that her days were spent following Frank from courtroom to courtroom and applauding when he won a case. Despite his mother’s intense surveillance, Frank was by all reports an intelligent, well-adjusted young man and capable lawyer whose friends believed he would thrive once he threw off his mother’s yoke. They suggested marriage as the proper antidote. Frank took their advice and began to assert his independence from his mother. In 1957, he stood up to the woman and in a knock-down, drag-out fight, told his mother to leave the apartment they shared. In revenge, Elizabeth took an overdose of sleeping pills. She was taken to a local hospital, had her stomach pumped and recovered. Herein lies the beginning of the tragedy. During her convalescence, she was treated by a pretty, 29-year-old nurse named Olga Kupczyk. Frank, visiting his mother for the first time after she awakened from her coma, spent as much time around Olga as he did with Elizabeth. She didn’t fail to notice the telling glances between Olga and Frank, and Elizabeth began to fear the very real possibility that another woman was soon to take her place. Characteristically, Elizabeth objected to Frank’s seeing Olga and telephoned her almost daily for three months. During the course of these calls, which she discussed with a friend, Emma Short, or made in her presence, she told Olga to “leave her son alone” and frequently threatened to kill her if she did not stop seeing him. Frank and Olga were secretly married on June 20, 1958, and when Elizabeth learned of the marriage she declared that she would not allow them to live together. Not quite ready to cut the cord completely, Frank stayed at his mother’s home until the end of June, visiting Olga in her apartment. During one of these visits Elizabeth knocked on the door and angrily demanded that Frank come home. A quarrel ensued, and he left with her. A few days later he started to live with Olga at another apartment, keeping the new address secret from his mother. Elizabeth was not to be trifled with. About the middle of July 1958 Elizabeth told Barbara Reed, whom she had known for several years, that Olga had become pregnant by another man and was trying to “frame” Frank. She offered Mrs. Reed $1,500 to assist her in killing Olga. Mrs. Reed replied that she would think the matter over, and later she informed Frank of the proposal his mother had made to her. Shortly thereafter Frank moved back to Elizabeth’s home. In the early part of August Elizabeth arranged with an ex-convict, Ralph Winterstein, to assist her in carrying out a fraudulent plan for the annulment of the marriage between Frank and Olga. Elizabeth posed as Olga and Winterstein as Frank. After a brief uncontested hearing in which Winterstein, as the plaintiff, testified that Olga had not lived with him since their marriage, that she refused to do so, and that she had told him she had never intended “to go through with the marriage,” a decree was granted to the plaintiff. Elizabeth later persuaded Mrs. Short to propose to Winterstein that he “take care of Olga.” Winterstein refused but did not report the incident because he was afraid of getting into trouble as a result of the fraudulent annulment. In the middle of August Elizabeth discovered where Olga was living and gained admittance to the apartment in her absence, apparently for the purpose of discovering whether any of Frank’s clothes were there. She was not kidding, and was actively trying to find someone who would do her dirty work. Elizabeth told another woman, Diane Romero, whose husband Rudolph was one of Frank’s clients, that Olga was blackmailing Frank and asked her to help “get rid” of Olga. At Elizabeth’s request Diane went to Olga’s apartment to “look the place over,” and Olga answered the door. Diane Romero recognized her as a nurse who had cared for her several years earlier, and she left after a short visit. Thereafter Elizabeth offered Rudolph Romero money to “get rid” of Olga, and he refused. During the time that she was seeking the assistance of the Romeros, Elizabeth met Rebecca Diaz, in whose house the Romeros lived. Elizabeth said that Olga was threatening her and demanding money, and she asked Diaz to help find a man to “get her out of town.” Diaz agreed to notify Elizabeth if she found anyone. On November 12, 1958, Elizabeth went with Emma Short to the Tropical Cafe in Santa Barbara. Esperanza Esquivel, who owned the cafe, and her husband had been charged with receiving stolen property, and Frank, as their attorney, had obtained a dismissal of the case against her and was seeking probation for her husband, who had pleaded guilty. Elizabeth told Esperanza that Olga was blackmailing her and had threatened to throw acid in Frank’s face, and she asked whether she had any friends who would help “get rid” of Olga. Esperanza replied that “there were some boys” but she did not know whether they would want to talk to Elizabeth. The next day Elizabeth, accompanied by Emma Short, returned to the Tropical Cafe and was introduced to Luis Moya, 21 and 26-year-old Gus Baldonado. Elizabeth told the men that her son was being blackmailed by Olga and said that she wanted to “get rid” of her. They discussed how much this would be worth to Elizabeth and agreed that she would pay $3,000 when the “job” was done and $3,000 within three to six months. 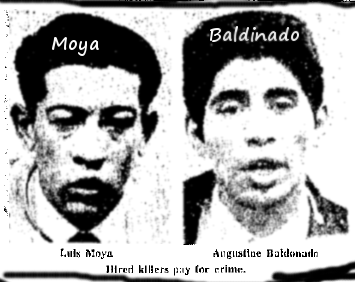 In that cantina, the quartet considered several plans and finally decided that Moya and Baldonado would kidnap Olga, take her across the border and kill her in Tijuana. Moya said that he and Baldonado would need money for transportation, a weapon, and gloves. Elizabeth left for a while and on her return went to the kitchen with Moya where she paid him $175 she had obtained by pawning some rings. “I think they are going to do it,” she told Emma as they drove home. She was right. Moya was a petty thug who had a bad record. From the age of 11, he was a frequent drug user. At 12, he was frequenting houses of prostitution. His past offenses included theft, burglary, possession and smuggling of narcotics, and stabbing a person with a knife. He served several terms in jail and at least one in the penitentiary. Records show that he was not a cooperative prisoner and made several attempts to escape. His work record was “very spotty,” and he had been “kept” by various women. On the evening of November 17, 1958, they rented a car for $25, and drove to Olga’s apartment. When Olga came to the door, Moya told her that her husband was in the car, drunk, and asked for help, and she went with him to the car. Baldonado was then in the back seat bent over as if he was passed out, pretending that he was Frank. When Olga opened the rear door, Moya hit her on the back of the head with the pistol and Baldonado pulled her into the car. On their way out of Santa Barbara, they drove to the beach, where they stopped because Olga was screaming and struggling. While Baldonado held her, Moya struck her on the head with a borrowed .22 caliber pistol, knocking her unconscious and breaking the handle of the gun. Baldonado tied her up with tape, and they continued on out of town. A short time later they had trouble with the car, and, instead of following their original plan of going to Mexico, they drove into the mountains near Ojai, in Ventura County. They dragged Olga out of the car and down the side of a hill to a culvert that ran under the road. Because it had been used as a cosh, the pistol was damaged so that it could not be fired, and Moya and Baldonado took turns strangling her. After a while they could not feel her pulse, and they dug a hole and buried her. As this was not part of the plan, the men had no tools by which to bury their victim and later told police they had dug the shallow grave with their hands. Returning to Santa Barbara, Moya and Baldonado hid their bloody clothes and the seat covers of the car. They tried to clean the car by sweeping it and spraying lacquer to hide blood spots. The next day they told the car’s owner that the seat covers had been burned by a cigarette and that they would fix them or give her money for repairs. Moya contacted Elizabeth and informed her that they had performed their “part of the bargain.” She said that she had not been able to draw any money out of the bank because the police had been inquiring about Olga’s disappearance. Elizabeth cashed a check which Frank had given her to pay for a typewriter, and she met Moya by appointment in a downtown store in Santa Barbara, where she handed him an envelope containing $150. Later, at Elizabeth’s request, Emma Short left an envelope for Moya with the cashier of a restaurant. The envelope, which was addressed to “Dorothy,” contained $10, and Moya obtained it by saying it was for his aunt. While she was making payments to the two killers, Elizabeth was questioned by Frank about the check he had given her to pay for a typewriter, and she told him she was being blackmailed. Suspicious and grief-stricken, Frank informed the police and said that he was afraid his mother was involved in Olga’s disappearance and was being blackmailed for that reason. The investigation which followed resulted in the arrest of Moya and Baldonado. Olga’s body was disinterred on December 21, and the pathologist found that Olga had been pregnant and that her death was caused by head wounds, strangulation, or suffocation such as would be produced by being buried alive. A few days after Moya was arrested, he asked to see a minister, and Reverend Floyd K. Gressett came to the jail in response to a call from a police officer. Moya testified that when he talked to Reverend Gressett he got on his knees and for the first time in his life asked God to forgive him. Reverend Gressett decided that Moya was sincere and was ready to confess to God and man. Immediately thereafter Moya confessed to law enforcement officers that he murdered Olga. He testified that he believed he had been forgiven, that his religious feeling had increased, and that he was sorry he had killed Olga. 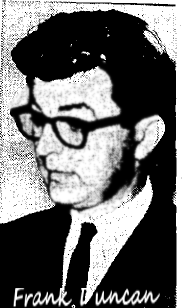 A psychiatrist, Dr. David R. M. Harvey, testified that Moya was a sociopathic personality who profits neither from experience nor punishment, was a constant danger to society, and was capable of murder “right now.” Dr. Harvey said that a sincere religious belief is a good start toward rehabilitation, but that the period of time during which Moya held such belief was too short to permit a determination as to the validity of his conversion. On the stand in her own defense, Elizabeth denied any knowledge or involvement in Olga’s murder and said the payments to Moya and Baldonado were made because Esperanza Esquivel had threatened her because she was unsatisfied with Frank’s legal advice to her husband. The jury didn’t buy it, and all three conspirators were sentenced to death. On August 8, 1962, Moya and Baldanado died next to each other, strapped into the metal chairs of California’s gas chamber. When Elizabeth Duncan was led into the chamber shortly after, she looked around and noticed that her son was not there. He was in a federal court, trying to win a last-minute reprieve for the woman who killed his wife. “Where is Frank?” were Elizabeth Duncan’s last recorded words.